If you are reading this, it's probably because you’re looking for the best buy for your seven-year-old son. Well, you have come to the right place. 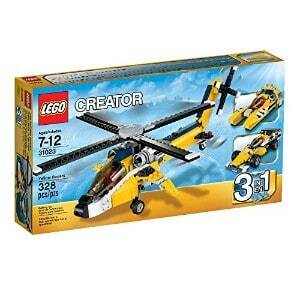 There are numerous aspects that factor into the best toys and gifts for seven-year-old boys. Choosing the right gift for your son is not easy; therefore, you should make the most out of the following list of tried and tested favorites. Below are our top 20 choices for the best toys and gifts for your seven-year-old. Read on and take your pick. From animals to vehicles, this building set allows your child to create numerous functioning models. The set comes in 480 parts and pieces, including connectors and rods that are attachable to each other in various ways. It also includes an instruction booklet featuring 35 models. Your son will be able to build airplanes, trucks, and auto parts like wheels and wings. What's Great About It: Allowing son to build numerous figures, this item can enhance his creativity and problem-solving skills. Having an instructional booklet also helps a lot, as it allows your child to easily accomplish each project. Young boys love speeding around on scooters, so this would be a great option for your son. 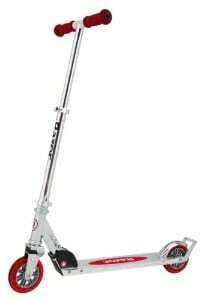 It features 125-mm inline-style urethane wheels, a wheelie bar design, and a patented rear fender brake. It also comes with a patented folding mechanism. What's Great About It: Its durability also makes it safe to use, which is great for your adventurous little trickster. As for physical development, this item helps improve your son’s balance and strengthens his muscles. Cars normally catch the interest of young boys, and with this product, your son will not just enjoy playing with a toy car, but will learn how to build one. This set allows him to build three mobile cars, increasing the excitement of this kit. The product comes with 76 pieces that include axles, gears, and joints. It also comes with three instructional guides, but your son is free to use his imaginations to build any vehicle he wants. It also includes 12 wheels with rubber tires. What's Great About It: The item showcases flexibility, as it allows kids to build different figures. Being a building set, this car designer can enhance your kid’s imagination, creativity, and problem-solving skills. 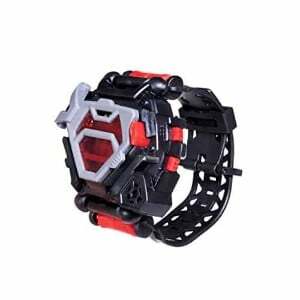 This watch is best for kids who love make-believe plays. It comes with eight gadgets in a working watch. With this item, your son can write, decode, and deliver secret messages using safe-drop capsules. While playing with this spy watch, your little spy will be able to time missions using the stopwatch and detect intruders using its motion sensor alarm. Players can verify international times with the use of the world clock and set alarms for missions. This spy watch includes sky paper and two message capsules. What's Great About It: The item comes with durable materials, making it last a long time. With the nature of games it offers, it can improve your son's imagination and communication skills. Playing dodgeball is fun, especially for young boys who are physically active. Does your son love playing different sports? If so, then he will love this product. This set offers a twist on the classic dodgeball game. 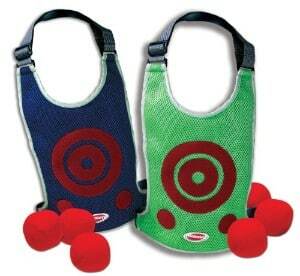 Instead of merely throwing and avoiding the ball, the goal will be to make the balls stick on the opponent’s vest. This exciting twist will keep your son entertained for hours. 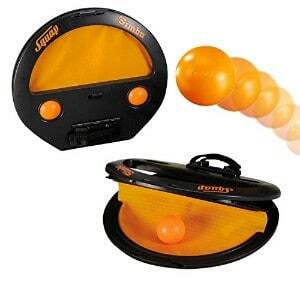 The product comes with six soft dodgeballs and two adjustable air-mesh vests. What's Great About It: The balls used in this set are soft, making them safe for children. The entire product is light, and you can take it with you wherever you go. Playing with this set encourages active play and improves timing and accuracy. These walkie talkies are a great gift idea because boys love to play pretend. It comes with 836 channel combinations and features a maximum range of two miles. With its LCD display, it becomes easy to locate conversations in progress. 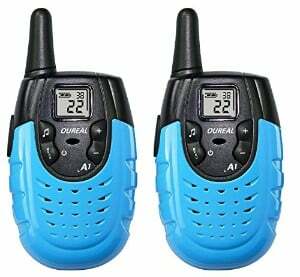 These walkie talkies also feature hands-free operation and uses battery saving technology. What's Great About It: The voice activated transmission feature frees the hands for other tasks that your son might want or need to do. Meanwhile, its battery saving technology allows the devices to have an extended battery life when not in use. 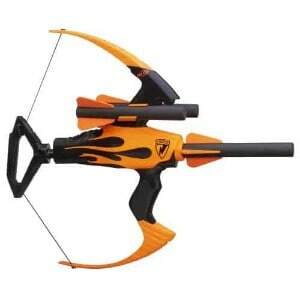 If your son is a fan of the Robin Hood story, this bow blaster would be a perfect gift for him. It comes with real bow action and can fire up to 40 feet. It also includes three huge foam arrows, and arrow storage, and features a 20-inch wingspan. What's Great About It: The item uses high-quality materials, making it great for kids to play with. It only weighs two pounds, making it perfect for your little man. It is very easy to carry and hold, fitting the hands of young children. Boys love robots, so this is another good choice for your seven-year-old. This is not your ordinary robot. 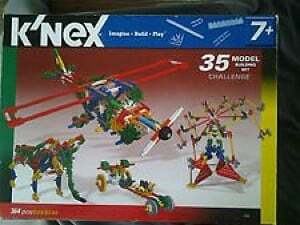 In this set, your kid will enjoy playing with colorful robots and manipulating them in a yellow ring. Giving a realistic feel are the matching sounds that comes with the product. What's Great About It: Complete with robots, a stadium, and sounds, your son will enjoy a realistic matching experience. It can also enhance his sense of competition. Playing darts is among the favorite activities of boys and men. 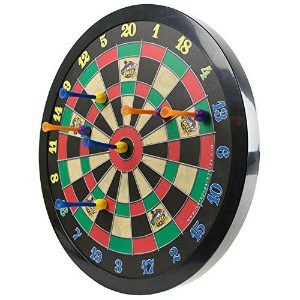 With this set, your son will be able to enjoy a 16-inch magnetic dart board and six magnetic darts. The darts are flexible and come in two colors. It uses strong neodymium magnets. What's Great About It: The darts are flexible and durable, providing good quality and a long-term user experience. Moreover, the strong neodymium magnets make one’s dart performance accurate. Given its features, this item suits both kids and adults. It can also improve aiming skills. This product is perfect for kids who have an interest in playing baseball. They can use it at home in the yard or outdoors at the park or on the beach. The set comes with four balls and two pop paddles. The item is light and portable, making it easy to bring along anywhere you go. It is suitable for camping, going to the beach or park, family trips, picnics, and playing at friend's houses. What's Great About It: Being compact and portable is a great advantage, as it allows your son to enjoy it anywhere. 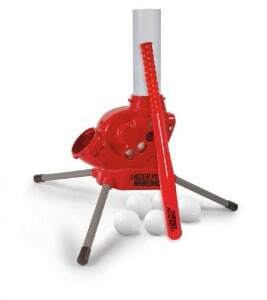 It is the perfect product for developing baseball skills. The fact that your child can play it at home makes his training even easier. If your son enjoys playing ice hockey, this toy may be the perfect solution for him. Not only will your little sports star be able to enjoy his favorite sport, he can play inside. The product comes with two hockey sticks measuring 18 to 28 inches and a 65 mm hockey ball. 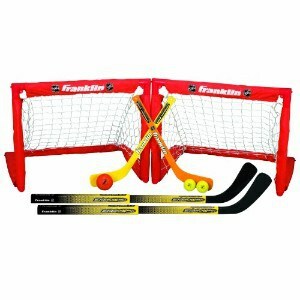 For knee hockey, the set includes two 50-mm mini foam hockey balls and two 15-inch hockey sticks. This is ideal for beginners. What's Great About It: The completeness of this product is its best feature. It gives your kid a rich hockey experience, as he can play it inside the house. Being a two-in-one set adds up to the player’s rich experience. This item is best for football enthusiasts. Designed to work in any weather, your son will be able to use it at any time of the year. 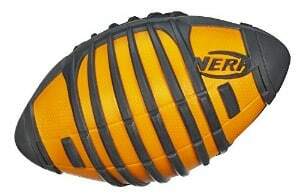 With this item, your little boy will be able to freely practice his throwing and catching skills. What's Great About It: Its exceptional durability makes it possible to survive all weather types. Your kid can use it in the rain, mud, and snow. This perk leads to having more time for your son to enhance his football skills. Toy vehicles appeal to young boys, and building sets appeal more. 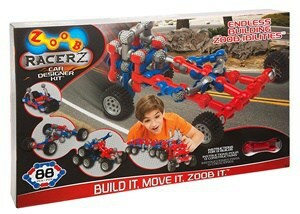 So if you want your son to enjoy a toy vehicle that he can build, this product is right up your alley. Your son will be able to build his own train and drive it through whatever track he can imagine. 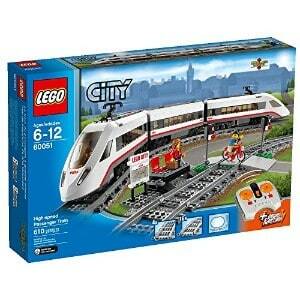 The set comes with a high-speed passenger train with a train driver and traveler. It also includes a circular track with four straight rail tracks and 16 curved rail tracks. The station features a warning sign, lights, a platform with two seats, a train services map, and a crossing. The set also includes a bicycle and a cyclist, adding to the realistic feel it provides. What's Great About It: The product is a complete set that enables your kid to use his imagination skills and creativity. It also gives him a realistic feel, given its numerous features. This set is perfect for anyone who loves cars. If your kid is a fan of Star Wars as well, then you should really buy this product. It comes with a fully functional vehicle that includes glowing light sabers on its sides. It also features authentic sound effects when the button on hood gets pressed or the car rolls. What's Great About It: The item is easy to operate. 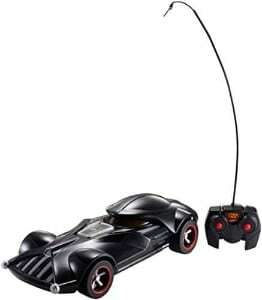 With the use of the remote control, your kid can easily send his car forward, left, or right. This product allows him to enjoy and appreciate his surroundings while enhancing his imaginative skills and creativity. Biking is a fun activity that can help improve your son's physical health. 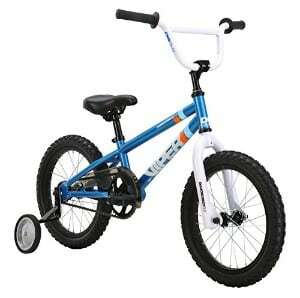 Buying this item for your son can influence him to go biking, allowing him to enjoy nature while keeping his body fit. This bike comes with a junior padded seat and is made with a heavy duty steel frame. It also includes training wheels, which you can easily remove as your son learns to ride his bike. What's Great About It: Coming with training wheels, this bike is good for beginners. It helps a lot in the process of transition, for the training wheels can be easily removed. This is an educational item that teaches kids about the moon. Moon in My Room features automatic and manual functions that show all twelve phases of the moon. You can hang this set anywhere in your kid’s room. 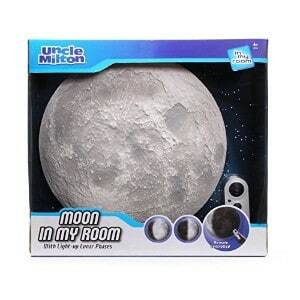 The set also includes MP3 download code that offers a tour of the moon that your son will love. What's Great About It: The automatic and manual functions enable your kid to have options when operating the item. Having the product around is a good start in familiarizing your young man with astronomy. It simultaneously provides education and fun. If you want a toy or an item that is good for your child’s physical and mental development, then you may want to check this rocket launcher. 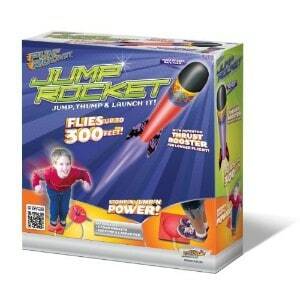 This product comes with three soft foam rockets, a launch pad, and an air pump. In order to launch the rocket, the player needs to jump on the air pump to generate pressure. In this way, your child is also doing some exercise without him knowing. What's Great About It: The requirement to jump on the air pump helps your kid become physically fit while having fun. It also stimulates his mind as he tries to jump harder and think of more effective ways to make the rocket fly higher. The launcher comes with improved technology that makes it possible for the rocket to fly high. This building set is perfect for your kid if he has great fascination for creating numerous objects. It comes with 375 pieces, which can be used to build 30 big figures. Among the things your child can build are vehicles and animals. 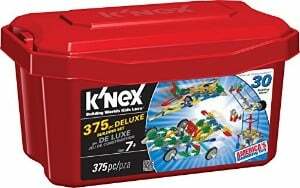 The set also includes a handy chest for storage, and building instructions for easy building. What's Great About It: The building instructions make it easier for kids to understand what they need to do to build the figures. The convenient storage chest helps prevent pieces from getting lost. 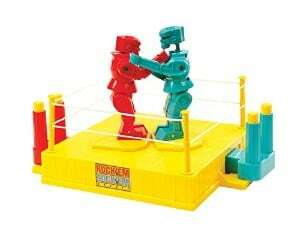 This toy allows kids to enhance their mental and physical skills. This building toy enables your kid to build various types of vehicles, including a race car, speed boat, and a helicopter. It comes with a main rotor, a spinning rear rotor, a multidirectional tail wheel, large engines, and retractable front landing gear. What's Great About It: As a building toy, it can help improve your son's imagination skills and creativity. Being able to transform into three popular and fast vehicles is also a great advantage. This item is best for kids who love baseball. It comes with five balls, a 26 inch remote control bat, and a pitching machine. Your kid can pitch up to 25 feet, and a red light will tell him when the pitch is coming. The pitching angle is also adjustable. The product also comes with auto mode that shoots pitches with any bat every eight seconds. What's Great About It: The adjustable pitching angle suits the needs of beginners as they gradually learn how to play the sport. As you have read, we have recommended items or sets that require physical movement. It is very important for boys to have strong bones, muscles, and bodies as they grow up. Therefore, it is crucial to expose them in various physical activities. A boy's brain is comparable to a sponge, for it has the capacity to absorb anything and everything it comes across. As a parent, you need to take advantage of this fact. See to it that your child learns the things he has to learn at this point in his life. We have recommended toys and items that can stimulate the minds of seven-year-old kids, particularly their creativity and problem-solving skills. As children grow up, both their needs and interests change. We did thorough research to find out the general preferences of seven-year-old boys – from physical toys to mental games. Quality and safety are two important traits of every child-friendly product. 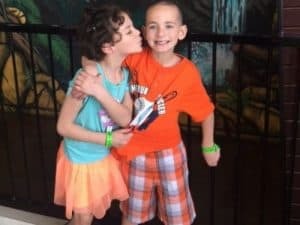 In searching for items to recommend, we made sure to pick ones that are exceptionally safe for seven-year-old kids and use high-quality materials. This is a combination of the aforementioned factors. You need to recognize the qualities that fit the needs of your seven-year-old son. Which item can cater to his various needs? We made sure we picked the right ones. With the factors we took into consideration, we are confident that we recommended the best products for your growing boy. One common notion about buying products is that expensive ones are usually the best. As you have read above, price is not enough. Actually, it should not be a basis at all. While it’s true that some good-quality products are a bit pricey, know that this is not always the case. Over the years, different manufacturers have come out with numerous promotions from time to time. As a customer, you should not easily give in to promotions and fads. The truth is that you may even find some popular items that are of poor quality. Thinking of an item’s brand can be tricky. While it is important to choose a reputable brand, know that it is different from merely choosing a popular one. The latter is a common buyer mistake that you should avoid. Never choose a brand only because of popularity. There are numerous other blunders that many buyers commit. Feel free to do your research and make sure to avoid such mistakes. Toys and gift items play a very big goal in your son's development. But what exactly are these developmental needs? As mentioned earlier, kids need to strengthen their bones, muscles, and entire body as they grow up. Doing so will lead to proper physical development, which can consequently enable them to properly adapt to the demands of everyday life. Being physically fit is very important; hence it is also crucial to regularly do exercises and other physical activities. Just like physical development, mental development is a very important aspect of growing up. Without proper stimulation of the brain, your kid might find it hard to learn new things. It is important for him to do some mind exercises, such as solving puzzles and doing some building projects. The things he will learn from these activities have real-life applications that he can take advantage of. When it comes to playing games, it pays to let your child play with a team. By doing so, you are helping him enhance his social skills. He can become more sensitive and responsible as well. As you know, having good social skills can help a lot in your child’s everyday life. While some toys and items can be enjoyed with a group, you will also find some that your child can use alone. Playing alone does a lot of good things to a person’s emotions. Allowing your child to play alone will develop his sense of self, as well as teaching him to entertain himself. As a concerned parent and responsible buyer, you should never ignore these needs. Choose toys and items that are best for your child. You have just learned about the best items you can give your seven-year-old boy. We hope this piece of writing will help you make the best decisions as well. Children’s needs change over time, and you should be mindful of such changes. Make your son's childhood years great and memorable by giving him the best gift for his personality.